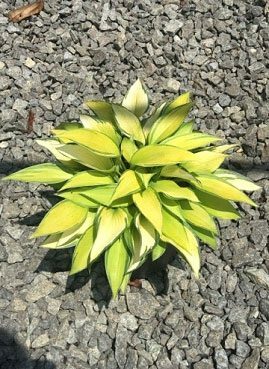 Although all hostas are relatively easy to grow in our area, some just seem to be more popular than others. That’s the case with the June hosta. This former Hosta of the Year (2001) gets top marks from gardeners over and over again. One reason for June’s popularity is the beautiful mix of colors in the foliage. You’ll find light green, blue-green, and gold on the sturdy leaves of this plant. But the variations don’t stop there: Did you realize that the depth of the colors can be affected by your hosta’s location? June is a prime example of this phenomenon. Plant it in a very shady spot and a lime green color will develop. Put it in the sun and you’ll see it at its most beautiful. Additionally, this hosta has lavender flowers that bloom from approximately June to September. Another reason so many people choose the June hosta is its long growing season. Foliage appears in the spring and won’t go dormant until we have a hard frost (typically late October or early November). It’s also resistant to slugs so it’ll truly thrive during this time.